For one of my projects I was looking for a NumberPicker to give the user the opportunity to select a specific duration. I found the great numberpicker 1.0.0 package from Marcin Szalek . NumberPicker is a custom widget designed for choosing an integer or decimal number by scrolling spinners. While this widged worked like intended, I was in need for a more general approach, a picker, wherer the user can choose from a predefined set of values. So I decided to sepearate values from it’s visual appearance. You have to inititalize the widget with a List of text/value pairs List<ValuePickerItem>. ValuePicker is heavily inspered by NumberPicker and shares some code, so please check the LICENSE AGREEMENTS of NumberPicker 1.0.0 of the source before you use it. This widget works fine for me but is not testet on different devices. 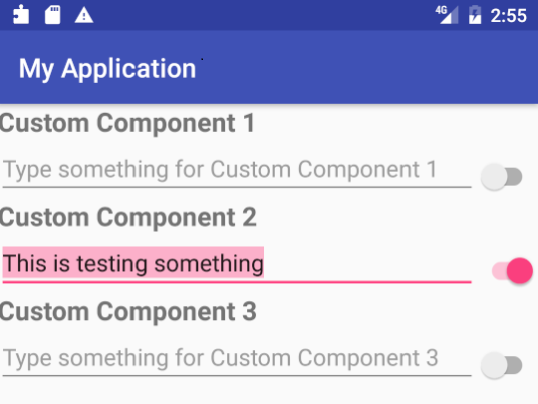 In this a article I want to provide some solutions for problems I was facing, when I started to use the Flutter™ TextField Widget for the first time. labelText: Text that describes the input field. When the input field is empty and unfocused, the label is displayed on top of the input field. 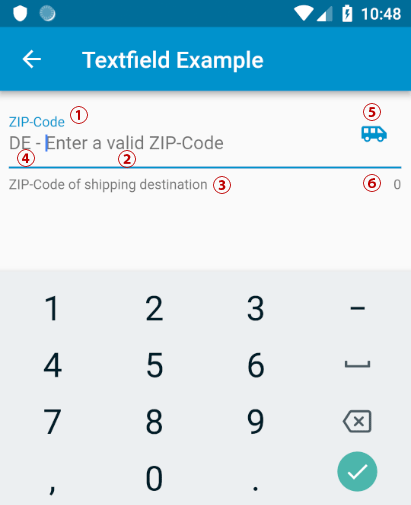 hintText: Text that suggests what sort of input the field accepts. Displayed on top of the input child when the input isEmpty and either (a) labelText is null or (b) the input has the focus. helperText and errorText: Text that provides context about the input child’s value, such as how the value will be used. If non-null, the text is displayed below the input child, in the same location as errorText. If a non-null errorText value is specified then the helper text is not shown. prefixText or prefixIcon: Optional text prefix to place on the line before the input. Prefix is not returned as part of the input. In this example a 2 digit ISO country code. suffixIcon or suffixText: An icon that that appears after the input and suffixText and within the decoration’s container. counterText: Optional text to place below the line as a character count. However, it would be cool to create custom widgets with this capabilities. All the widgets listed above are implementing the ImplicitlyAnimatedWidget class, so I tried to do the same: After some struggle I found a codesnippet on Stackoverflow which helped a lot. When creating UIs it’s a common task to build your own set of reusable UI Components, if you dont want to rely on the built-in set of the framework. I was very curious how this is done in native Android app-development and how this fancy new language Kotlin works in this context. 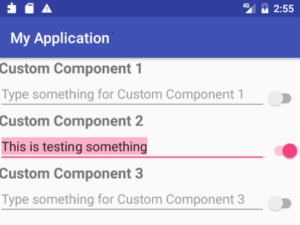 A quick search brought me to this excellent tutorial from Eley “Building Custom Component with Kotlin”. Create a reusable component which contains a label, an editable textline and a switch, formatted as you can see in the picture below (original picture slightly adjusted). I will show the lines of code you need to achieve this goal with Native Android + Kotlin on the one hand and Android -styled QML on the other hand. Now let’s see, how this can be useful in a real usecase. It’s a lot of work to provide icons for mobile devices, because of the large number of different formfactors and screen pixel-densities. To ensure that you get sharp icon shapes you need to provide different icon-files (usually png-files) for each DPI class. Are you looking for an easy way to implement a fully customizable, nicely animated progress circle in QML? Use a canvas control to paint the arc and a full circle as a background. You can set the size of the control, colort and the start and end angle of the arc. If you change the angles, the change will be animated – of course, you can turn the animation off. If isPie set to true, a pie segment is painted instead of an animation.